I know what you must be thinking. “Soy chorizo is blasphemous!” Stop judging for a minute while I explain. There are lots of ways I like to expand my caloric intake during the holidays. And normally, I’m a big proponent of only using real chorizo. But my intuition told me that this year, I’d better find a place to cut some fat and calories, because let’s be honest: as I get older… my metabolism is slower, and I can’t afford to feel terrible from overeating for days after Thanksgiving. And the chances are I will end up overeating, even if only a little bit. Does soy chorizo taste “just like the real thing,” you ask? This meat-eater says no. Not exactly, anyway. But it’s pretty close, and when mixed into a recipe, one will hardly notice the difference. If you’re apprehensive about pulling it off, you can always mix half-soyrizo and half chorizo your first time (just be sure to drain the grease from the real chorizo). I wouldn’t serve this dish if I didn’t think it was worthy, and boy, is it worthy! This recipe is an excellent option whether you plan to serve it to vegetarian guests, or just to cut calories in one dish so you can indulge somewhere else. 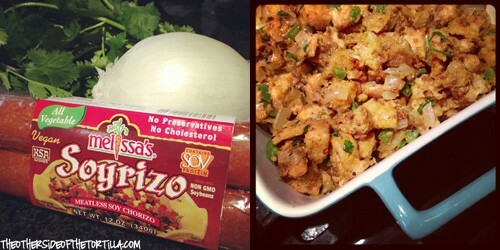 Thankgiving turkey stuffing gets a Mexican twist with jalapeño, soy chorizo and cilantro. Prepare soyrizo according to package directions, plus add the rice vinegar during cooking, and set aside. Melt butter in a deep skillet and add onion and jalapeños. Saute over medium heat until the onion starts to look transparent. Turn off the heat and remove pan from the stove. Toast 12 slices of white bread and cube into bite-sized pieces. Add to the skillet and stir to coat the bread with remaining butter. Beat the egg and poultry seasoning together. Pour over the bread mixture and stir well. Add the chopped cilantro and stir well to incorporate. Heat 3/4 cup of milk (do not boil) and pour evenly over the stuffing. Mix well. Add the soyrizo and mix well. Spoon into a casserole dish (sprayed with non-stick cooking spray) and cover with aluminum foil. Bake in the oven at 350ºF for 30 minutes. 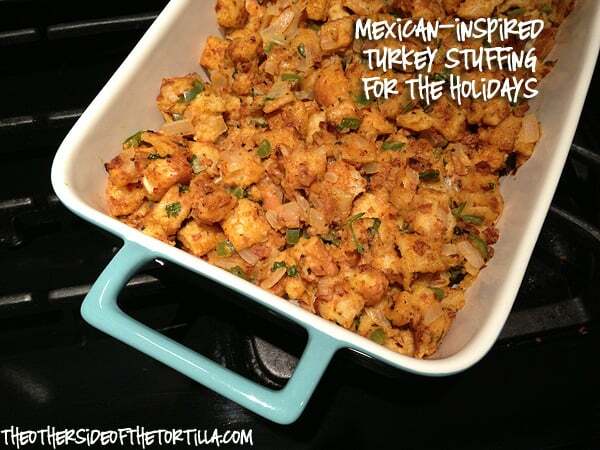 Do you have a holiday dish that you substitute ingredients to cut the calories or fat? Let me know what it is in the comments below! And if you try this dish, please come back to leave a comment to let our other readers know that serving soyrizo at your holiday table didn’t cause an apocalypse!